We had a blast at Children’s of Alabama South for their Nurses Give Back week. The nurses collected over 5 pounds of pop tabs and over $200 for the Ronald McDonald House plus they invited us to hang out at their facility for the day. Ronald stopped by and took photos with the nurses and patients alike! 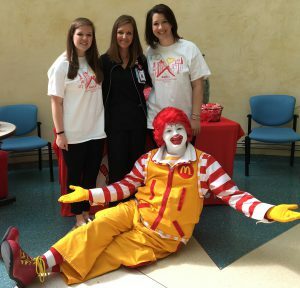 We enjoyed telling everyone, nurses, patients and families about RMHCA and how they can get involved. The nurses at Children’s of Alabama South went above and beyond to give back for Nurses Week, a week that celebrates them. Next time you are at this beautiful facility, thank them for us! Check out more pictures from the day on our Flickr page! If you are interested in raising funds for RMHCA, check out our Fundraiser page!